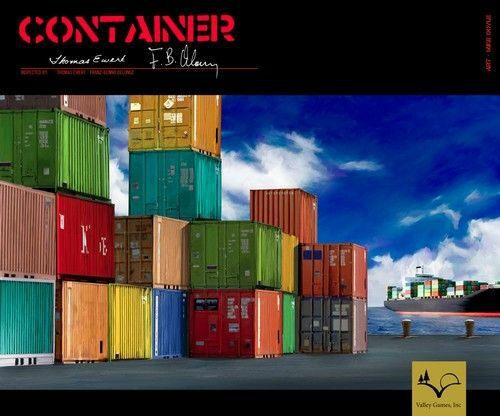 Container is a game about big ships and big production. Each player will play both as a producer and shipper of goods. Players will decide which products they want to produce, and which of the OTHER players’ goods they want to ship out to a remote island. During these phases, players will be able to set the prices for their goods and try to maximize their cash! Once the goods have reached the island, players will play the part of the purchaser for their tiny island. Players bid for the goods arriving each day by ship, and the highest bidder collects these goods for conversion into points at the end of the game. Sounds simple? It is! But the real challenge is turning your home production into goods for your island. Your government is willing to subsidize your purchases, but just how much money do you want to give to your competitors for that lovely crate of goods your island desperately needs?